I travelled here from Arugam Bay in a three-wheeler (auto-rickshaw), which cost R800 and only took one and a half hours, along a pretty, quiet road. I shared the ride with a young Sinhalese man who’d been a soldier during the civil war and had been injured by a land mine near Jaffna. After a while he took off his cap, parted his hair and showed me the scarred and melted skin on the top of his head. He was smiley and bright-eyed and it seemed he’d escaped obvious brain damage, but there was also, understandably, an air of sadness about him. He was still a teenager but he needed a crutch to walk, he had a bandage on one hand and unhealed wounds on his feet. I said to him I thought the war had finished two years ago, to which both he and the auto driver said no, it hadn’t – I wondered if they fully understood, or if there really are factions fighting on. We stopped a couple of times at roadside shrines where the driver, who was in a very jolly mood, got out to say a prayer, and even handed me some coins to put in the donation box. He also bought a packet of lemon puff biscuits and they were shared equally between the three of us. The boy handed each biscuit to me with a smile and I felt part of a little gang as we trundled along the well-maintained, virtually empty road, passing miles of bright green paddy fields. 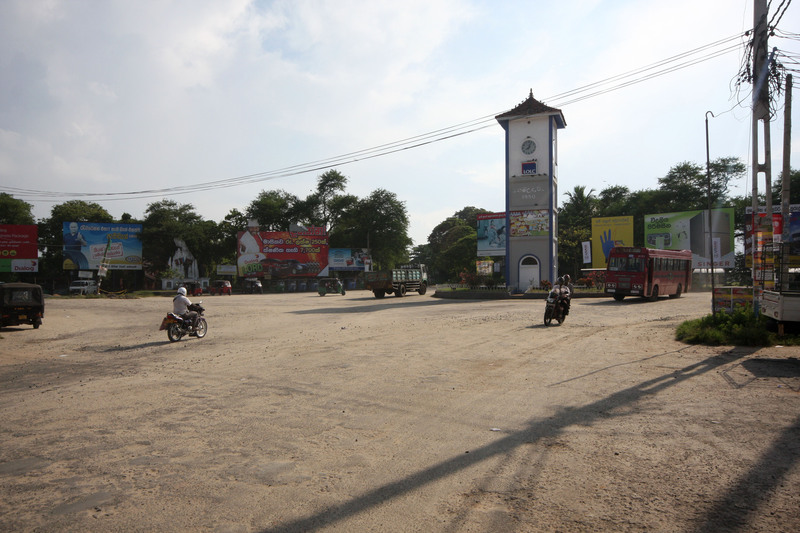 Ampara is a small town but it has a wide main street, along which the humdrum buildings straggle, leading to a roundabout and behind this a large man-made lake called Ampara Tank. The auto took me to the door of the Ambhasewana Guest house (Tel. 062 2223865), where a large room with 3 beds was only R750. It was a quiet, relaxed little family place, on a peaceful back lane, and they made me a cup of tea, although unfortunately they didn’t provide meals. 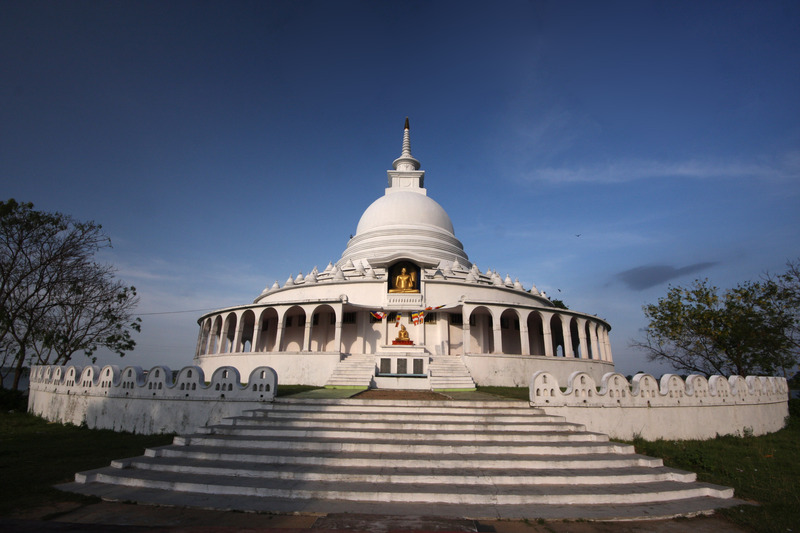 The main reason I wanted to come to Ampara was to see the herds of wild elephants that the Lonely Planet said passed close to a Japanese Peace Pagoda every evening between 5 and 6pm. This pagoda was apparently only 2km from town. So I set off about 3pm, when it was marginally cooler, stopping first in a bakery near the clock-tower for an egg roll, an excellent samosa and a milk tea. The samosas are generally different here to India, although you can find the Indian type. They have a kind off breadcrumb coating, are slightly chewy and are stuffed full of vegetables and sometimes boiled egg, as this one was.First I walked to the Sri Manika Pillaiyar, a Buddhist temple en route to the Pagoda, along the road to Inginyagala. It was a pretty route but I was ‘bibbed’, as they say in E. London, by practically every moped and lorry, which was a pain. It’s bad enough walking along next to a fairly busy road without the traffic on that road suddenly swooping up close to you and the people in the vehicles yelling out then laughing hysterically! The temple had good views across the Tank and contained a friendly monk, who pointed out all the pictures and statues, after I’d given a tiny donation of R10. He was particularly proud of a picture of the Shiva, Parvati, Ganesh and Murugan happy family, in which the images were all outlined by small flashing lights of different colours. Most people know Ganesh (the elephant god), but Murugan (also known as Skanda), the elder son of Shiva and Parvati, is a lesser known deity, at least in India. 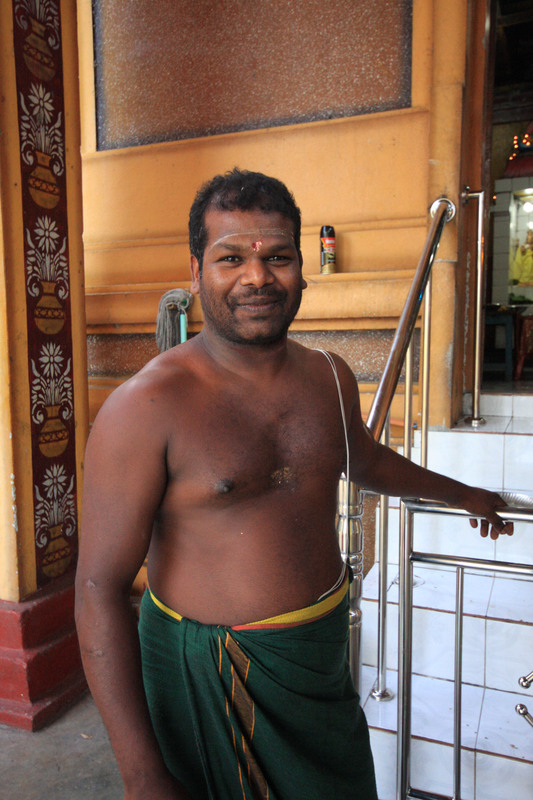 In Sri Lanka he’s worshipped all over the place as the God of War, and in pictures of him grown up he’s shown with three heads, riding a peacock. It doesn’t seem an obviously war-like mount. From there to the Japanese Peace Pagoda was only supposed to be another kilometre away but in fact it was more like 3km, or certainly felt like it, as I had to walk all around the edge of the Tank to the far side, with the Pagoda in view much of the time but never seeming to get any closer. I arrived before 5pm, in time for the elephant show, and did a tour of the pagoda. It was built by the Japanese, hence ‘Japanese pagoda’ and there are pleasing views across the Tank, with plenty of bird life. No elephants appeared but three students from the nearby Hardy Technical Institute arrived and were friendly, and entirely uninterested in chatting me up, which was a relief! They told me – surprise, surprise – that the elephants probably wouldn’t come because the fields had been harvested so there was no food for them here anymore. If only I’d come last month, in May, there were elephants everyday. ‘At least I’d get to see one then,’ I said, churlishly! Apparently the elephants lived in the forests on the far side of the lake, to the NW of Ampara, and I gazed over there, willing them to appear. 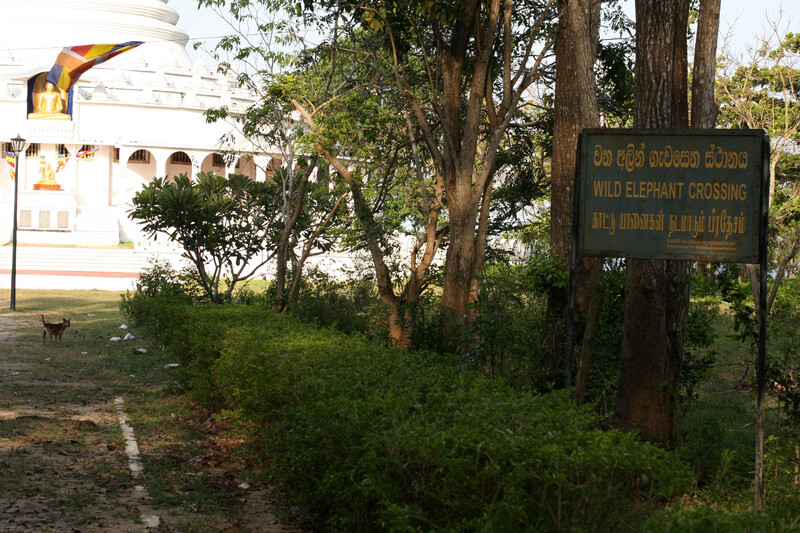 The students told me if I wanted to see wild elephants I could definitely see them near dusk at the Buddhangala Rock Hermitage, about 7km from Ampara. They warned to be careful because this site is in the middle of wild countryside. I headed back to the road but was diverted by a large group of people, mainly women, who’d just arrived by bus and were filing into the image room near the pagoda. I joined them and sat on the floor while an old nun prayed and hit a gong. Afterwards she said ‘arigato’, for the Japanese who provided the funds, and then handed out sweets! I gave a token R10 donation, which made her happy. You really don’t have to give much, but it’s important to give something. I’ve noticed that even though the currency has 2/5 the value of Indian money, people usually still give beggars and temple donations just a couple of rupees. By this time it was almost sunset – about 6pm – and a bus went past without stopping as I was walking the short distance back to the road. The three students caught up with me and told me it was probably the last bus since they didn’t run after dark. ‘Better for you to walk,’ they said. ‘It’s not far. It will only take you about 20 minutes.’ Considering it had taken me over an hour to get here (including the stop at the temple), I doubted this estimation. ‘Be careful of the elephants!’ they joked as they left me and turned in to the Technical College. I didn’t find this hilarious! It was quickly growing dark and I had a long way to go. Thankfully, when I was only gone a little further a bus came past and I gratefully got on it. It was dark less than ten minutes later. Eating in Ampara I didn’t notice many restaurants in town, apart from places selling short eats and coffee, but there are market stalls with good, cheap fruit, and there’s a Cargill’s Food City, which is a decent national supermarket chain.